“Twelve Things” is a blog post series in which I feature a list of twelve things that concern a specific topic. The idea behind these posts is a nod to my username “wijangco12” and my favorite number. How I Discovered the Book: I know Rafe and found out about it from his Twitter. What It’s About: The book is a collection of first-hand accounts from some of the biggest names in basketball, recalling historic moments to when they fell in love with the sport. Why I’m Interested in It: Simply put, I love basketball, so not reading this book seems absurd—especially given the fact that one of my favorite writers, Rafe, helped make the book a reality. One of the greatest things about basketball—sports in general really—is its power connect people and place them into a community together. I actually started this book last year, reading a few pages, but it only took reading a small part of the book to learn that this book celebrates that idea and reminds us that, no matter whether we’re merely a fan or an important figure in the sport, we’re all connected by this love for basketball. How I Discovered the Book: I found it while browsing Barnes and Noble one day. What It’s About: As the title suggests, Betaball explores how the Golden State Warriors developed into an NBA-championship team through smart business actions, science, and Silicon Valley culture. Why I’m Interested In It: When I first saw this book, it reminded me of a NBA-version of Freakonomics. I enjoyed reading Freakonomics for my honors English class my sophomore year of high school, so this seemed like a great, informative, unique read that I’d like. How I Discovered the Book: My sister read it in her sports history class. What It’s About: This book highlights important moments in women’s sports history in the U.S.
Why I’m Interested in It: I’ve always been interested in sports, but because women’s sports aren’t as mainstream, I’ve never learned as much about women’s sports and female athletes as I’d like—which I’m honestly ashamed of. I want to know more about the impact different female athletes have had in sports, and this seems like a great book to start that education. 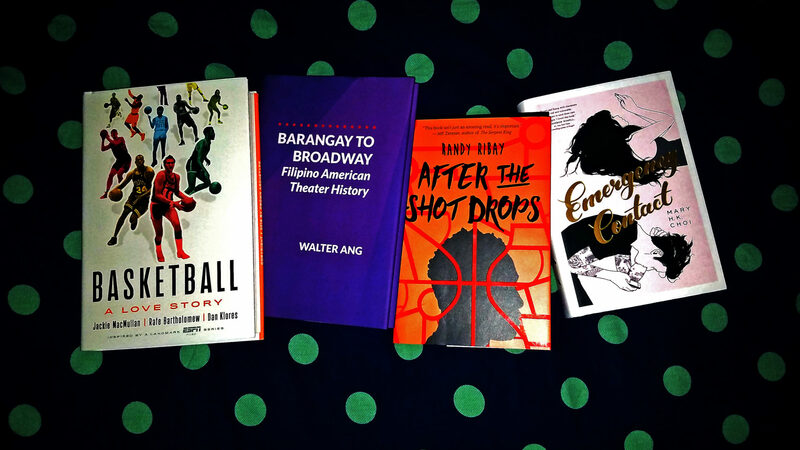 How I Discovered the Book: I stumbled across it online while doing research about Filipinos on Broadway. What It’s About: As the title suggests, this book concerns the history of Filipino American theater and how it became what it is today. Why I’m Interested in It: One of my biggest goals since graduating college nearly two years ago is to learn more about my Filipino heritage. Growing up, my parents didn’t teach me to speak tagalog or about the Philippines—be it the countess history or just what life was love for then there. I get that I could’ve always asked them about it myself, but I just never did. As a kid, I didn’t see much of an importance to really knowing and understanding your heritage, but I realize the importance of it now. I’ve also become increasingly interested in Broadway during the past year and a half or so, so I’ve wanted to learn more about the history of Broadway. Barangay to Broadway is a great way to achieve both goals. How I Discovered the Book: I came across the book when I found other psychology and sociology books about Filipinos. What It’s About: Simply put, this book explores the influence colonialism had on Filipinos and Filipinos’ internalized oppression. Why I’m Interested in It: As I’ve grown older, I’ve become more aware of how colonialism has affected Filipinos. I’ve experienced it firsthand with my own parents, such as when I’d be told I got “too dark” from being outside in the sun instead of embracing the brown color Filipinos naturally are. I’d like to learn more about this influence and how vast it is. How I Discovered the Book: I either found it at Barnes and Noble or through a recommendation from Amazon. What It’s About: This book explores the history of the Philippines, starting with the 16th century and ending with its Islamic insurgency. Why I’m Interested in It: The whitewashing of history is no secret, so I’ve never really gotten a chance to learn about the Philippines beyond the minimal information taught about their inclusion in World War II and the Spanish-American war. Despite it being the country my parents grew up in, they didn’t teach me about it either. It feels weird to not know more about the country from where I gained my heritage from, so this book is a good place to start. How I Discovered the Book: I discovered it after reading a Playbill article and/or while looking at the theatre section in Barnes and Noble. What It’s About: Something Wonderful highlights the creative partnership of Richard Rodgers and Oscar Hammerstein II and how their works have impacted musical theater. Why I’m Interested in It: Ever since I developed a legitimate interest in Broadway not even two years ago, I’ve been doing my best to learn more about musicals. As is with any subject, knowing its history is important, and Rodgers and Hammerstein are crucial figures in Broadway history. So this book will help me learn more about them, their work, and the influence they’ve had on musical theatre. How I Discovered the Book: I’ve seen it at Barnes and Noble several times and came across it as a recommendation online. What It’s About: What If It’s Us is a young adult fiction novel about Arthur and Ben’s summer romance in New York City and whether the universe is trying to keep them apart or together. Why I’m Interested in It: Young adult fiction is one of my favorites genres to read, so it’s not surprising to find this on my list. Not only have I heard that it’s a good book, but I’ve also heard that it includes several Broadway references. That sold me on the book. How I Discovered the Book: I found an article about it in Goodreads’s newsletter. What It’s About: The book is a coming-of-age novel about Lucy Adler, a 17-year-old basketball player in New York who often finds herself to be the lone girl playing ball at public parks. Why I’m Interested in It: The Falconer is a novel by a sports writer, which I’m very intrigued by, because I’m a freelance sports writer who thinks it would be cool to one day write a novel. But even better, the book is about a coming-of-age story about a 17-year-old female basketball player based in New York, and, as a huge basketball enthusiast who loves New York, I absolutely love that’s who the main character is. As someone who has–and still does–struggled with being the lone girl interested in basketball, I’m intrigued by what this narrative will present. How I Discovered the Book: I saw an Instagram post with a photo of the book, looked it up, and was intrigued by the description. What It’s About: Penny and Sam meet in an awkward manner, but that doesn’t stop them from exchanging phone numbers and develop a relationship via text. Why I’m Interested in It: One of the best things about technology is being able to connect regardless of location. For some people, having a connection is much more easily dinne through technology such as text messaging and social media–which I, as an introvert, totally relate to. As such, I’m interested in getting an inside look at how Penny and Sam develop their relationship and how strong of a connection they’re able to make. How I Discovered the Book: My friend posted a photo of the book on her Instagram story. What It’s About: Nikole Paterson gets proposed to by her boyfriend of five months, who happens to be an actor, at an L.A. Dodgers game. She declines the proposal but receives backlash by the disappointed crowd at the game. A man, Carlos Ibarra, rescues her from the chaos, and he ends up being her rebound. Why I’m Interested in It: One of my reading goals this year is to venture out of what I’m used to. Most of the books I read are sports nonfiction and young adult fiction. I’ve come to really enjoy fiction in the near two years, so I’m trying to venture into general adult function. The Proposal has an intriguing plot that doesn’t stay too far from the young adult fiction I’m used to, so it seems like a good book to ease me into the adult fiction genre. How I Discovered the Book: I discovery her poetry on Instagram. What It’s About: The book is a collection of poems and other poetic writing with themes of self-love and healing among others. Why I’m Interested in It: When I found her poetry on Instagram, or immediately resonated with me, so I felt the book would have other poems I would relate to. In the past couple of years, I’ve tried doing other writing beyond my journalistic work, and creative writing is one area I’ve wanted to explore. I’ve tried doing some poetry but want to read more of it to help me better understand the genre and to improve my own poetry skills.